CASI recognizes outstanding achievement by Canadians in aeronautics, space and related technologies by means of its Senior Awards. Canadians working in these areas have achieved international distinction and acclaim over the years and the Institute is committed to ensuring that their accomplishments enjoy wide recognition. Perhaps you know someone, or a team of individuals, who may qualify for one of our Senior Awards. If you do, please consider taking on the leadership role – be the ‘champion’ – for the nomination. The nomination should respond to the criteria for the Award you have in mind and should highlight relevant aspects of the career and accomplishments of the candidate(s). The information provided should include testimonials from several people who have direct knowledge of the career and accomplishments of the candidate. The strength of a nomination increases with the number and stature of people endorsing it. Please consult the complete list of the Senior Awards and their criteria, lists of past recipients, and nomination forms. To submit nomination documents or if you have any questions or would like some assistance with a particular nomination, please email us. 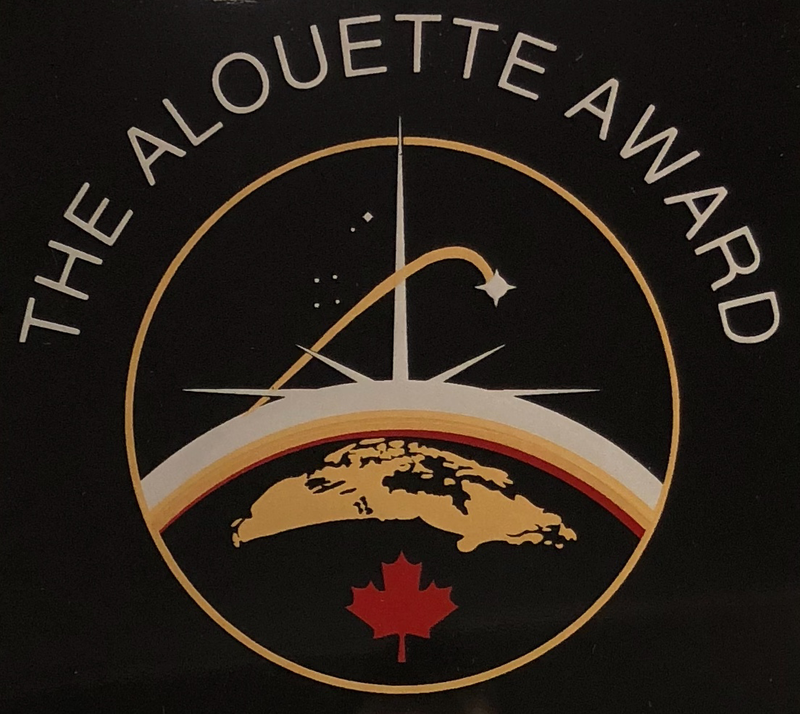 The Alouette is an award introduced to recognize an outstanding contribution to advancement in Canadian space technology, applications, science or engineering. It may be awarded to an individual, to a group, an organization or group of organizations, as appropriate to the nature of the contribution. The trophy shall be awarded for an outstanding achievement in the field of astronautics as defined by the CASI By-Laws. The achievement may be either a single outstanding contribution or, in the case of an individual nominee, a sustained high level of performance resulting in several advances in space. The contribution on which the award is based must be recognized as a Canadian-led space endeavour or as a significant Canadian contribution to an international program. Preference shall be given to contributions that lead to new benefits for mankind. The recipient shall have been a Canadian citizen at the time the contribution was made. In 1966 CASI introduced the C.D. Howe Award in honour of The Right Honourable C.D. Howe. 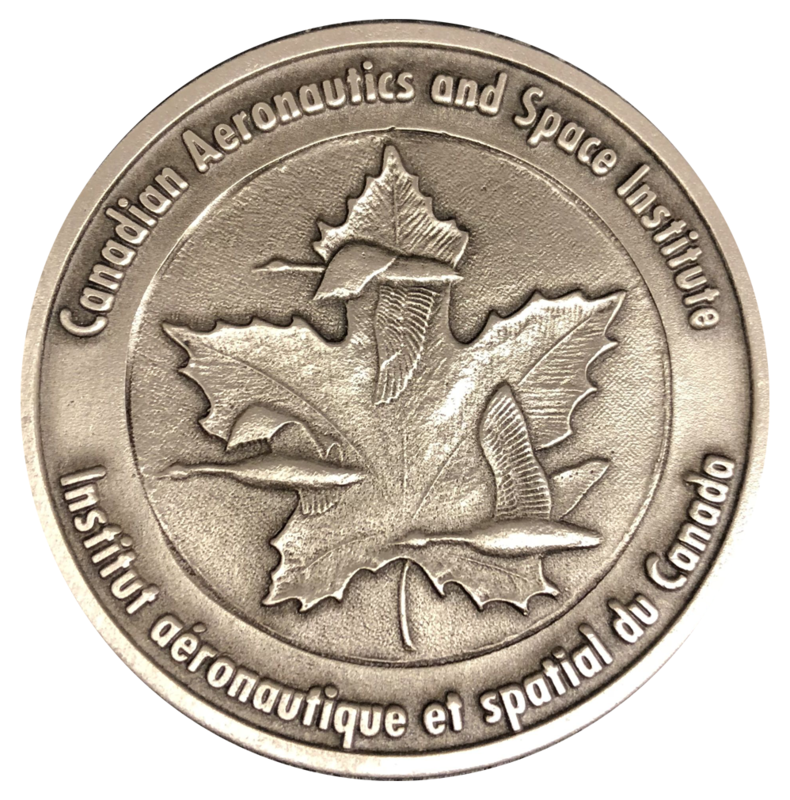 The Award is presented for achievements in the fields of planning and policy making, and overall leadership in Canadian aeronautics and space activities. The achievement for which the award is given shall be of permanent significance, and its benefits to aeronautics and space activities in Canada shall have been unquestionably established. To this end, the recipient shall have sustained an outstanding personal performance in these fields for at least ten years and it shall be reasonably certain that the merits of his achievements will be unassailable in the light of history. The recipient shall have been a Canadian citizen during the time the contribution was made. The award is presented for outstanding achievement in the science and creative aspects of engineering relating to aeronautics and space research. The achievement must constitute the most significant contribution made in recent years toward the advancement of science and technology in aeronautics and space exploration, and must be worthy of special recognition. The contribution may be administrative in nature, but it must be directly related to science and technology, and have been sustained over a number of years at an imaginative and creative level above that which would normally be considered a competent and successful performance. The recipient shall have been a Canadian citizen at the time the contribution was made. The Roméo Vachon Award was introduced in 1969 by the Canadian Aeronautics and Space Institute in memory of one of Canada’s outstanding bush pilots. It is presented for outstanding display of initiative, ingenuity and practical skills in the solution of a particular challenging problem or series of challenging problems in aeronautics and space activities in Canada. The achievement for which the award is given shall be of technological nature, particularly practical skills, not necessarily in the scientific or engineering fields. The recipient shall have been a Canadian citizen at the time the contribution was made. 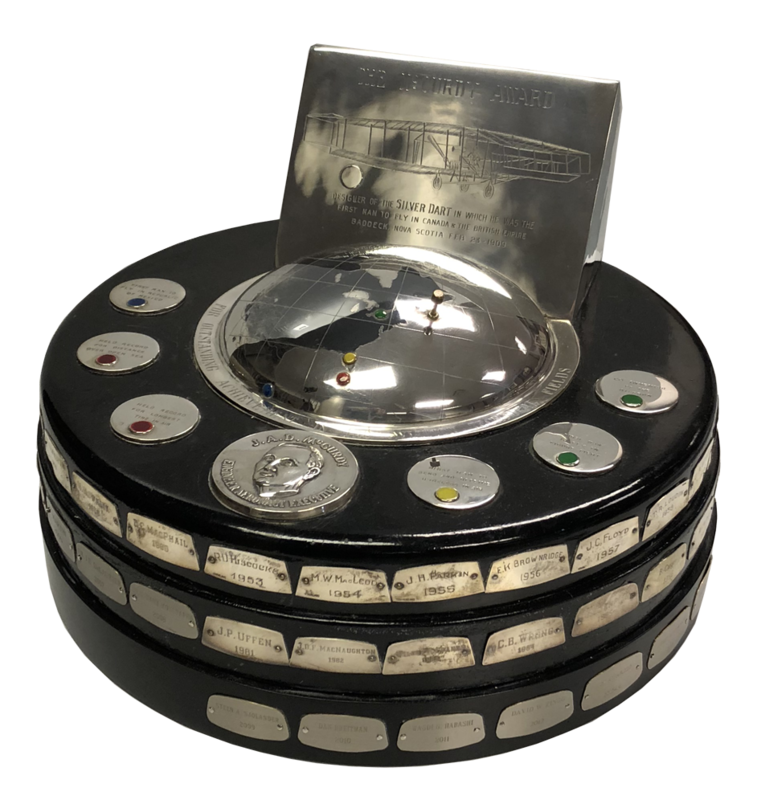 The Trans-Canada Trophy, generally known as the McKee Trophy, is the oldest aviation award in Canada having been established in 1927 by Captain J. Dalzell McKee. In 1926 McKee, of Pittsburgh, Penn. accompanied by Squadron Leader Earl Godfrey of the RCAF, flew from Montreal to Vancouver in a Douglas MO-2B seaplane. McKee was so impressed by the services provided by the RCAF and the Ontario Provincial Air Service that he established an endowment by means of which the greatly coveted McKee Trophy is awarded to the Canadian whose achievements were most outstanding in promoting aviation in Canada. The Trophy was deeded to the Crown in the person of the Minister of National Defence – in the days when the Department of National Defence controlled all flying, military and civil. It was retired in 1964 and reinstated in 1966, and in 1971 administration of the Trophy was transferred to the Canadian Aeronautics and Space Institute. From 1964 until its move to Canada’s Aviation Hall of Fame in 1983, the Trophy was on display at the National Museum of Science and Technology in Ottawa. The Trophy is awarded for outstanding achievement in the field of air operations. The achievement for which the Trophy is awarded may be a single brilliant exploit within the past year, or a sustained high-level performance in recent years; pioneering of new areas of air operations and advancement of the use of aviation shall receive consideration over achievements serving no useful end. Qualifications as aircrew shall be a prior claim to consideration. The recipient shall have been a Canadian citizen at the time of the achievement.